A while back, Retrovolve’s Josh pointed out that your fond memories of cheap old video games are probably inaccurate. He compiled a list of N64 MSRPs, and the prices he found are kind of terrifying. It’d be easy to pretend that this phenomenon began with the N64, that Nintendo’s last cartridge console was the beginning of the end. 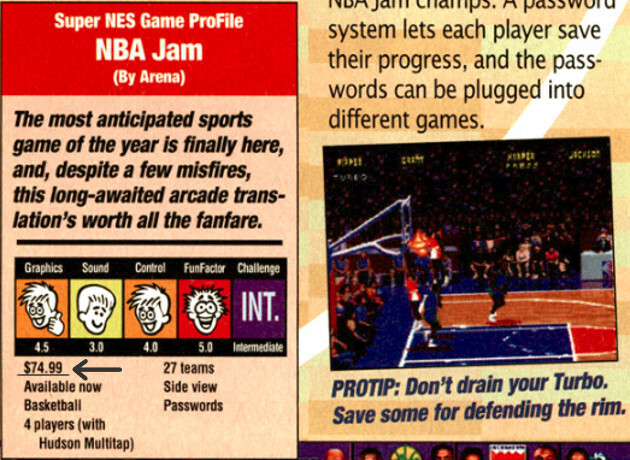 However, a look back through the pages of GamePro reveals that prices for Super Nintendo games were just as high, if not higher. What gets me is that people weren’t just shelling out tons of money for classics; they were paying for games with names like “Super Alfred Chicken.” I remember a few of these games being flat-out terrible, and even the best titles probably weren’t worth seventy 1994-dollars. To be fair, there were ways to game that didn’t involve spending a small fortune. Blockbuster’s rental prices were pretty reasonable, and clip-out coupons were once a gaming magazine staple. Still, it’s hard not to feel sticker shock when looking back at old MSRPs. I have no shortage of nostalgia, but I’ll take GOG, Steam sales, and PlayStation Plus over these prices any day. Hey at least games were as finished as they were going to be back then. Now many games treat early adopters like game testers. Couldn’t do that with carts. Why do you people that keep crying that not actually get the point that IF a game was broken it also stayed broken back then? I’m so tired of people crying and crying about how games were finished and there was no DLC, while conveniently forgetting that if a game was broken it didn’t get fixed and alot of them with very few exceptions were meant to be beaten in a couple of hours…. I don’t think I’ve mentioned it before. Look at big selling RPGs of the 32 bit era. Some of those were long games, but they played through, out of the box. Look at New Vegas. That was so buggy when it was released that you could really find a broken mission in normal play. Don’t get me wrong, I love the modern advancements of games but there’s something to be said about the days before we were all hooked up, too. Why do you people keep excusing crappy unfinished consumer products as if they in any way are justified? Its as if you like crappy products. Most of us don’t mind DLC released well after a complete game is released, but its as if some seem to be perfectly fine with day one or in game DLC that is clearly an attempt at scamming the consumer. Let me ask you why we should allow any business to sell unfinished products? Most of are willing to wait for bug testing, and reject in game DLC for fully paid for games. Those cartridge prices are insane. If it was up to nintendo the industry would still be on cartridges, since they produced them. I didn’t pay those prices for any of those games. Rabbit Rampage was an awesome game from Sunsoft though. Tim is right. With carts, there were not updates or patches, so the game had to play perfectly right out of the box. Not anymore it seems. Wow that’s insane. How was Nintendo even okay with these prices in the first place? What I remember is that Sega Genesis prices were usually a good $10 cheaper than Super NES, at the stores around here (Georgia). But just like today games quickly became discounted and a lot of stores sold them for less than MSRP. Renting was bigger back then.